« Why Is This Recovery Different from all Others? Sarah is feeling and expressing the same frustration, even anger that most Americans are today. No matter how much the Government plays with the CPI, people still see and feel the real inflation we have in this country today. I’m old enough to remember when Cokes were a nickel. Now they are a dollar! Ron, I don’t know what you mean about “playing with the CPI.” Do you have any documentation or are you just helping to propagate an urban legend? You can’t infer anything about inflation which refers to a rise in prices generally from the rise in the price of a single commodity. If you are old enough to remember when a bottle of Coke was a nickel, you are talking about 50 years ago or more. What on earth does that have to do with inflation over the past three years? 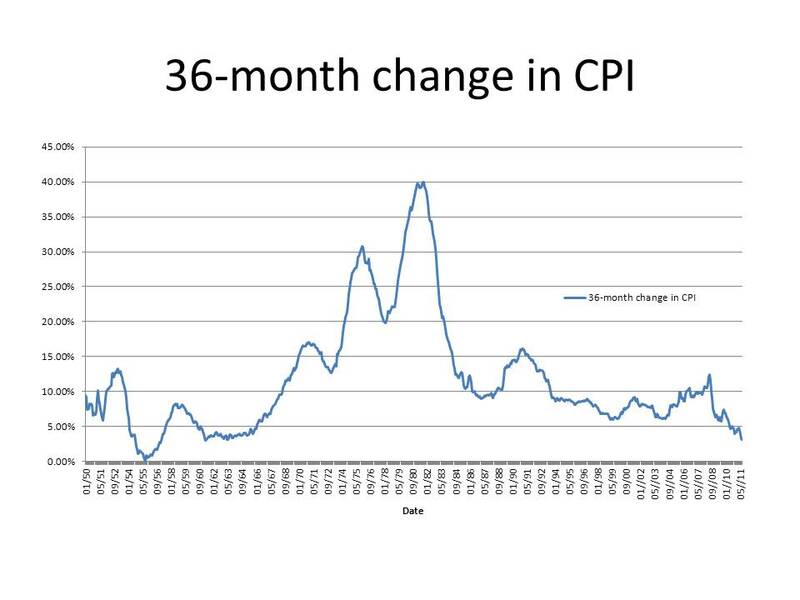 If you look at this graph you will see that the CPI over the past 3 years has risen at the slowest rate of any 3-year period in 50 years.